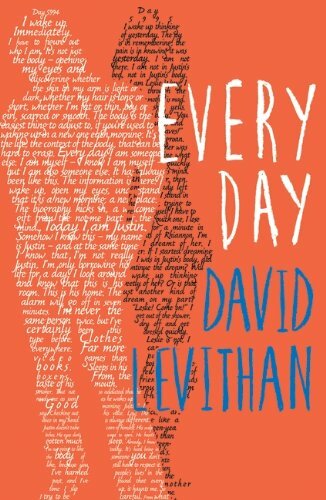 Book Review: Every Day by David Levithan | What Does Mel Think? This book was given to me by a friend through Secret Santa last year and I have been dying to read it for ages so naturally it had to make it to the top of my humongous TBR list. Not to mention that the cover is so beautiful, I love how words from the book were incorporated! If I tell you that I read the whole thing in 24 hours, I think you will gather where this review is heading. I promise NO SPOILERS though, because everyone really needs to read this. The general concept of this book and as much as I can tell you without giving anything away, is that a 16 year old boy/being (it's never clarified but I will address A as a 'he') wakes up every day in a different body and has done so for his entire life. However one day he meets a girl who he falls totally in love with and has to find her again. If that doesn't draw you in I don't know what will! Aside from the love aspect of the book, A's life is very insightful. He covers a lot of ground in terms of equality, having adapted to so many different bodies he has come to the conclusion that we all have about 98% in common with each other but we focus on the 2% difference. This is really eye opening when you think about prejudices we automatically have without even knowing and all of those issues do focus on the 2% of things that are different in us, we don't acknowledge all the valuable parts we have in common. This book also covers a lot to do with mental illness, one chapter in particular really hits you in that he wakes up in the body of a girl who is graphically planning her suicide in 6 days. It is so interesting to hear Levithan's take on how depression affects the body and mind, and it is so important for subjects such as these to be a part of modern culture and not to be glossed over as they are becoming increasingly important to understand. This is only a small part of how powerful and honest 'Every Day' is, I put the book down after finishing it and felt like I had learnt so much in 400 pages. This isn't just a book that is enjoyable to read, it is one of the most insightful books I have ever read. It is one of those that you can read over and over again and learn something new each time. So this is a very positive start to summer for me; this will be going down as one of the best books I have ever read. I strongly urge everybody to give it a go as it has so many important messages that need to be understood. I love when you walk away from reading a book and feel like you will carry it's messages with you through life. Oh wow this sounds so intriguing! I will have to look out for this and deffo buy it!